In what we didn't know was the first of several terrorist attacks on the USA, the USS Cole was attacked by cowardly fanatics. 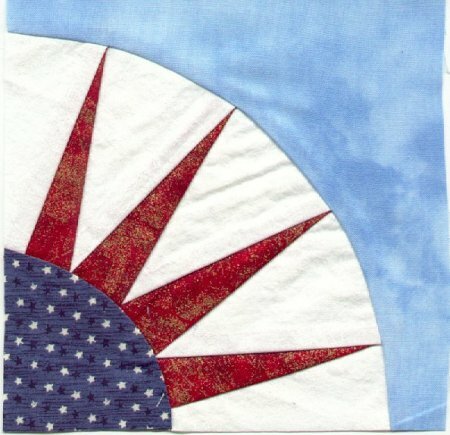 A web site created by Pat Tribbey, (a member of a volunteer group at America Online) as a tribute to the incredible, awesome effort started and completed by Sandy Guilbeaux, tells of the terrorist attack and Sandy's subsequent effort to make a quilt for each family of the USS Cole's victims. Her effort spawned such an upswelling of patriotic support that was completely overwhelming in scope. 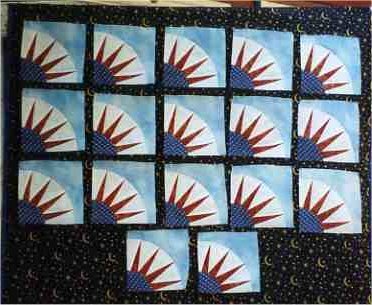 My small part of this effort was to make a 17 blocks, one for each of the family quilts. I am very proud to have been a part of this effort. 2012 update: I discovered that the URL to the website that Pat had created on AOL was defunct. As a result of some sleuthing on the internet, I was able to find Pat and ask her if the original website existed anywhere else. Her reply was, "... AOL disbanded all those groups and no longer supported the webpages that the volunteer members of the groups created. So, the pages were removed. The pages no longer are on the internet. So, any links you may have are old ones and no longer work." She didn't add any further explanation of why the volunteer group couldn't simply re-create the AOL website someplace else. It's a real shame that testimonial has been eradicated.